Opening cans is quicker and easier with the Kenwood CO606. 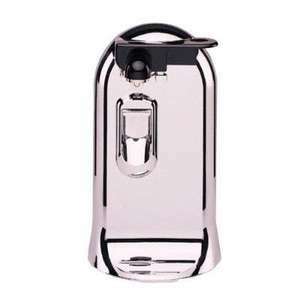 This three-in-one can opener can open most shapes and sizes of can, up to 1.2 kg, and operates hands-free because the can is locked into the machine. To operate the CO606, simply hold the can under the guide pin and press the lever lightly and the self-starting blade will pierce it and commence cutting. The can remains fixed in position with the magnet resting against the lid until the can is open, when the motor will automatically stop, while retaining the can and lid safely in place. The Kenwood CO606 has non-slip feet and the blade can be removed for easy cleaning. It is a three-in-one tool that also features a bottle opener and knife sharpener, making it a handy and functional accessory for your kitchen--ideal for time savers and those who have difficulty working a manual can opener. If this can open fray bentos steak and kidney pie's i will marry it! thank you. Was looking for one of these for a christmas pressie! Perfect timing. Good Christmas gift, it will also crack nuts if you smash it on them. Got a white one - going strong since 2007! Been meaning to get one of these, great timing, thanks! Just tried to order as Christmas Pressie but unfortunately delivery not until January now, Good deal for anyone that doesn't need for Christmas though, heat added! ordered, heat. bought a manual one not long ago from tesco, that was £5 and its not the best build quality so that makes this is a bargin. still available. I ordered one the other day, it came this morning - looks neat -but I haven't needed to open a tin all day though, even the cat chow has a ring pull tonight!! this has not expired, just click on '26 new' link and amazon are still listing it as £8.50 delivered. how do you get deals unexpired on this forum? I can confirm it will do this! I have had mine since 2007 and have open a few fray bentos in that time! These are good, but they're very loud. Still, our one has been working for a good long while now. I bought mine from Amazon. It's good.